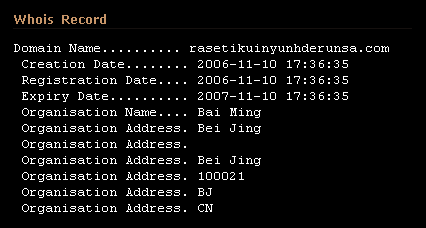 After seeing several domains related to Warezov during these past few weeks, here comes another new domain, still registered to Bai Ming. The new domain name is rasetikuinyunhderunsa.com for those of you that wish to block it. Our detections for the new variants are Warezov.GX and Warezov.GY. The detection package is included in database release 2006-11-22_01.